Don’t forget to keep a look out for the rhinos in Exeter this summer! 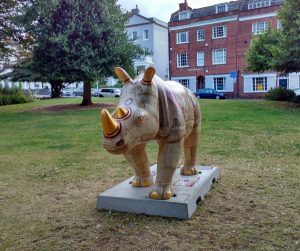 For 10 weeks, a public trail of 40 life-size rhinos will feature on the streets, parks and open spaces of Exeter and the English Riviera. http://www.exeterviews.co.uk/exeter-photographs/rhinos-in-exeter/ was Hope located down on the Exeter Quay.